Leeds United have signed Scotland international striker Ross McCormack from Cardiff for an undisclosed fee. The 24-year-old, who has signed a three-year deal, could make his debut at Watford on Saturday. 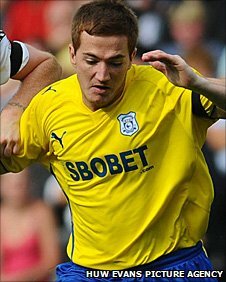 He scored 33 goals in 88 appearances for the Bluebirds since joining from Motherwell for £110,000 in 2008. Meanwhile, Leeds boss Simon Grayson has told BBC Radio Leeds that a potential move for Cardiff City's Gavin Rae has not gone pass the enquiry stage. He said: "When I spoke to Dave about Ross McCormack he mentioned one or two others who might be available, but it was just an inquiry and that's all it has been." Midfielder Rae, 32, spent 12 years in Scottish football with Dundee and Rangers before joining the Bluebirds on a free transfer from the latter in the summer of 2007. He has since made 131 Cardiff appearances, scoring seven goals.